I received a very generous package in the mail a couple of months ago, a gift I’d have blogged about sooner but for the fact that I hadn’t, at that time, any real information about what I’d been given. 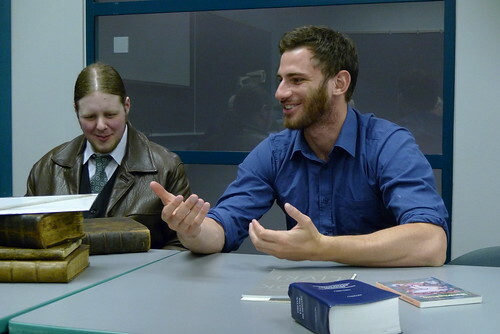 It was a box of books, all by Alexandre Dumas, and all published in Hebrew. 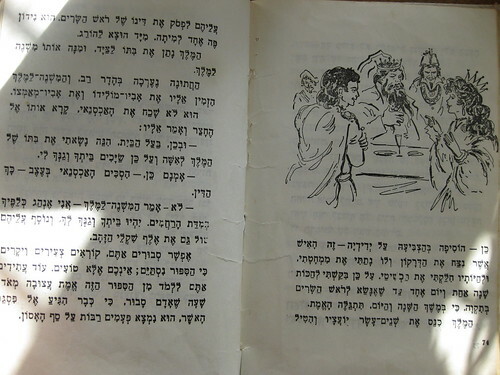 The sender, a collector of Hebrew children’s books who lives in Israel, had included little notes telling me the literal translations of the titles, but little else. I suppose not much else was needed, but the book historian in me wanted to know more: were the books printed in Israel? Was the art local as well? Are these abridged or complete editions? What kind of things might be added, or subtracted? 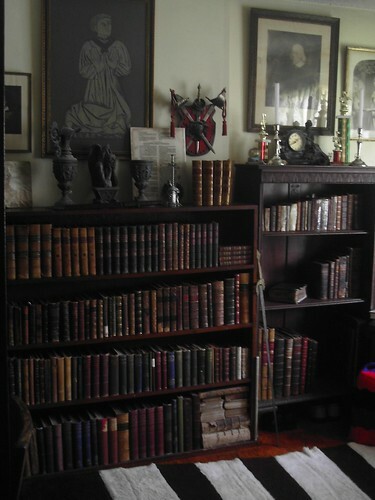 What makes these books distinctive or representative of where they came from? So they sat on the shelf at my book store waiting for a Rabbi acquaintance of mine to visit so that I might pick his brain. He did, finally, arrive, but I’m sorry to say he couldn’t give me much more information than I already had. 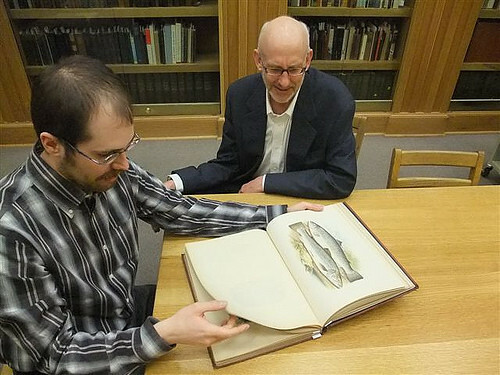 The books didn’t have much more direct information printed on them, and my research is hamstrung by a linguistic barrier. My kingdom to be a polyglot, let me tell you what. But this is an old story in book history circles – we all only read so many languages (in my case, a whopping two) and so the study of literature tends to be pretty localized. Never mind. The books are still beautiful. 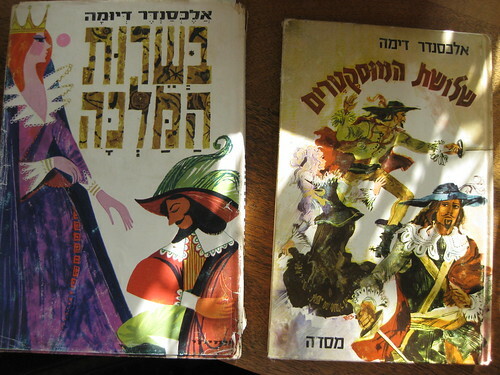 The books in the photo on the left are Hebrew editions of The Three Musketeers (right) and something called “Au service de la reine” (left). The latter is not a title used by Dumas for any of his works, and so could be anything from a selection of short stories, to excerpts from one of the romances, perhaps the Musketeers or The Queen’s Necklace. 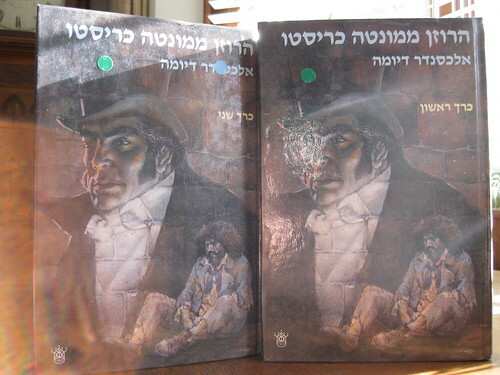 Both are large print editions, and Au service also shows use of vowels, something not typically included in a grown-up book for native readers of Hebrew. The name of the author has been translated differently on one book than the other. To the best of my knowledge, the cover art is specific to this edition. Next, we have a 2-volume edition of The Count of Monte Cristo which looks decidedly more serious. Editions of Monte Cristo tend to, no matter where they are from. I suppose this is because this is one of literature’s most famous stories of uncompromising revenge. Not quite all fun and games for kids, though I hasten to add that The Three Musketeers has its share of tears as well – recall that D’Artagnan’s lover Constance Bonacieux is done away with pretty handily, as is Milady. I have a sombre Spanish edition of Monte Cristo (“El Conde de Montecristo“) that I once felt reflected something of the Spanish character, but I now suspect is more in keeping with most publishers’ interpretation of the story. If you have any idea what this one could be, do share. The title is, literally translated, The Twin Hunters; again not a title Dumas uses for anything. It is a collection of children’s stories about animals. The pictures are often very clearly influenced by 20th century renditions of well-known fairy tales, but are also examples of very early Israeli engraving and printing (circa 1960s). Based on the pictures I found myself doubting if these were Dumas at all, but the work is most certainly attributed to him. Well, who knows? This is the fellow, after all, who penned the version of The Nutcracker that we all know from the Tchaikovsky ballet. If he’d hacked up a version of Sleeping Beauty or similar as well, I wouldn’t be surprised. Part of me loves that I have no idea what these books are. It’s all part of the ongoing mystery. I am a wretched book collector in that sense – I don’t have a neat and tidy checklist of specific editions that I intend to buy, I prefer lobs from left-of-field. Put together now, for example, I have 18 copies of The Three Musketeers in five different languages. Nothing would please me more than a whole array of foreign editions, each less scrutable than the last. I do love the universality of Papa Dumas, and the endless diversity of books humanity has produced!